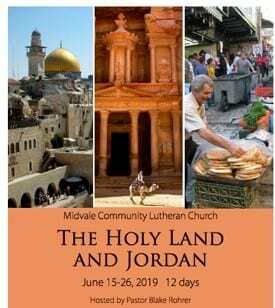 There is room to join this tour to Israel, Palestine and Jordan, June 15-26, 2019. This is an exceptional opportunity to experience the land of the Bible and give you a lifetime of insights and inspiration. You receive great value for the cost by traveling in a small group with an experienced guide, staying multiple nights in each location, and having airfare from Chicago, all breakfasts and dinners, gratuities and entry fees included. The tour is hosted by Pastor Blake Rohrer of Midvale Community Lutheran, and member of the Holy Land Advocacy Synod Team. All are welcome to join the group.